Every year the numbers of life sciences PhD graduates rise and many continue onto postdoctoral training, becoming an important pillar driving scientific progress. However, the long academic training often does not lead to secure jobs in academia, as the number of full-time faculty positions around the world have plateaued and even shrunk in the last 10 years (Nature 472, 276–279; 2011). Therefore, careers in industry and other non-academic environments are becoming more common for postdoctoral fellows, and with creativity and exposure, a wide range of jobs to choose from can become available to them. 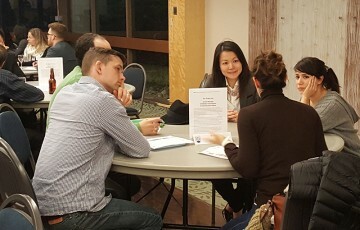 The Centre for Blood Research at UBC aims to help, organizing their bi-annual Postdoctoral Fellows Career Night event. It was held on March 2, 2016 and was co-hosted by the Postdoctoral Fellows Office and the Department of Microbiology & Immunology. 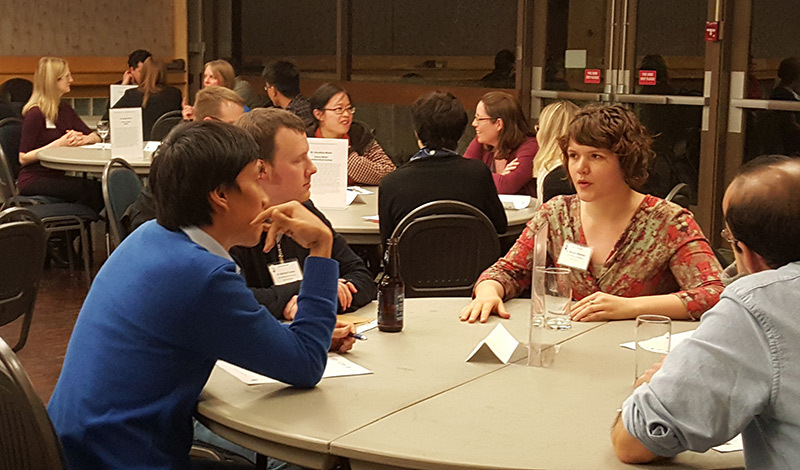 The event was open to all UBC postdocs, drawing 60-plus attendees. Eighteen excellent mentors participated to answer questions, and impart tips and advice for the postdoctoral fellows. Among them, you could have found big data and bioinformatics specialists, policy makers, R&D engineers, environmental planners, college instructors, business development specialists, product specialists, entrepreneurs, scientific writers and intellectual property experts. 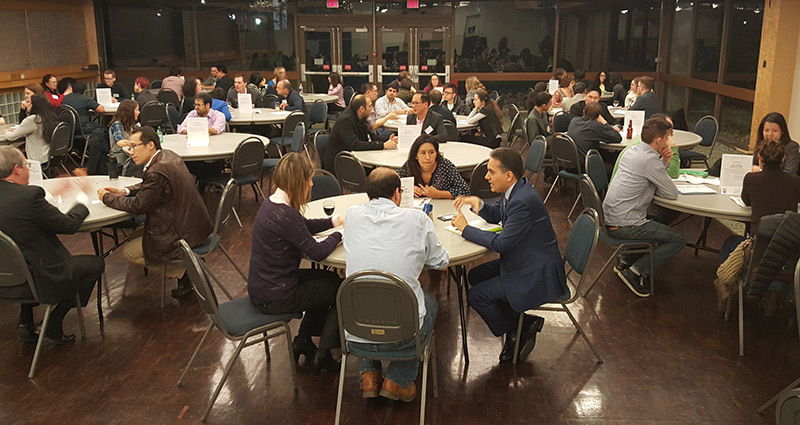 The night started with three 20 minute sessions, where participants had table discussions in small groups with their chosen mentors. This was followed by a delicious wine and cheese networking event, which allowed the conversations to continue, further building relationships among the mentors and the postdocs. Additional well-positioned academic mentors joined the group to mingle. A common theme of the night was to find your own way by making the most of your strengths, combined with a mindset of flexibility and growth. Neither staying in academia nor moving to industry, Dr. Geraldine Walsh found her own way and pursued her career as a scientific writer, currently working at the Canadian Blood Services’ Centre for Innovation. She was a postdoctoral fellow at the Biomedical Research Centre at UBC before realizing that her real passion was writing. Since 2010 she has been working as a scientific writer and editor. When asking her for a good starting point in a writing career she agreed that writing your own blog, or participating in volunteering activities that involve outreach and communication, can help grow writing skills and hone in on key interests and topics. One of the most energetic and enthusiastic mentors, Dr. Grace Lee, who is a neuroscientist, public speaker, marketing strategist, food blogger, and entrepreneur, shared her own way of building on strengths and interests. Frustrated with the academic system, Dr. Lee became engaged in e-commerce with her own marketing business and later accepted a management position in STEMCELL Technologies Inc. She believes that in order to be successful you should transform your passion to an idea and then your idea to business. A good way to get hired is to show that you are able to identify the company’s problem and to take it on with creative solutions. There is a common believe that having a certificate in MBA will help you to find better jobs and opportunities, but Dr. Rhonda Wideman who works as the Manager of External R&D and Alliances at Zymeworks, thinks that getting a certificate in Project Management is as valuable, while being less expensive. She also advised the PDFs to start working for smaller start-up companies, where there is more possibility of lateral growth and success. Her tip for writing resumes was to demonstrate flexibility and broad knowledge and expertise. Flexibility and networking represent key ingredients when transitioning to a new career. Dr. Naomi Galinski, now a 3rd tier technical support specialist at the software company Copperleaf, after obtaining a PhD in astrophysics, mentioned that her new employers declared to her they were looking for “CPUs and not memory” candidates. She recommends young graduates to openly approach potential companies and careers they are interested in, with the knowledge of how their PhD experience can be translated in a different field. Finally, Dr. Carol Friedrich-Fong, former PDF at the Center for Blood Research, now Program Head and an instructor of Biotechnology and Molecular Genetics in the UBC-BCIT joint Biotechnology program, also recommends graduates to identify their key strengths before commencing to apply for new jobs and consider how those strengths can match the type of job they are seeking. Reflecting on and knowing your value can help identify interesting and satisfying job opportunities. Overall, the CBR Career Night and other similar events provide a perfect networking environment for the job-seeking PDFs. This is a place not only to find mentors, but also to meet fellow PDFs and make lasting connections. After all, your next career may start right here!